He loves their dark, blank eyes. He loves their big mouths full of sharp teeth. And he loves pretending to be a shark and chasing Stacy around the playground. 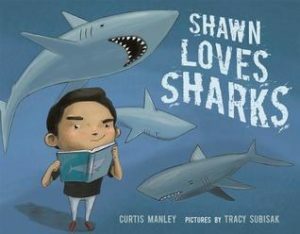 Shawn loves sharks more than anything else in the world. But Predator Day at school is on Monday and Great White Shark isn’t assigned to Shawn. I loved this book. Everyone can relate to being frustrated and disappointed. Shawn is frustrated and disappointed when he does not get the predator he wants. In fact his enemy gets it. This is a great book to help students understand how to deal with disappointment. The story also teaches about friendship and bullying. The illustrations are just as great as the story. Previous Post Boo Who? Next Post Class Pet Mess!